We'd love to share a little of our special alpaca experience with you through these photos from our California alpaca farm. Thank you for viewing our slide show. 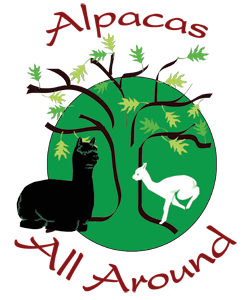 Please ﻿contact us ﻿to schedule a visit to see alpacas in person (our contact information is at the bottom of the page). From our farm photos, you can see alpacas in the fields at our California alpaca farm, alpacas interacting with children and people on the farm, and even some of the products that we have for sale in our farm store--made from alpaca fleece! Both alpacas and their products are very popular, and we have found raising them to be a very nice business. Yes, it has been hard work, but it has been rewarding work. We enjoy the lifestyle, and we have met many wonderful people who share in our passion for producing quality animals. Curious? Do some research, visit a ranch, call or visit us! Take that first step to a new and different life. We believe "Life is better with Alpacas all Around."